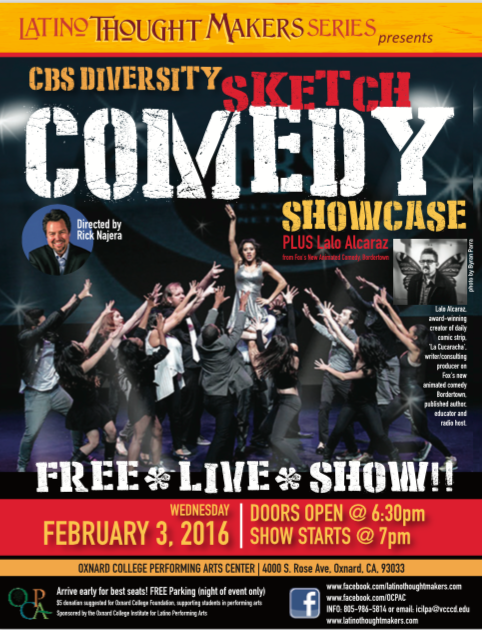 Oxnard, CA – [January 5, 2016] Oxnard College Institute for Latino Performing Arts presents the much-anticipated CBS Diversity Sketch Comedy Show directed by Rick Najera plus special guest from Fox’s new animated comedy Bordertown, Lalo Alcaraz on Wednesday, February 3. The special event takes place at Oxnard College’s state-of-the-art Performing Arts Center, 4000 S. Rose Avenue, Oxnard, CA 93033. Doors open at 6:30pm, show at 7:00pm. Entrance and parking are free. A $5 donation is suggested to benefit the Oxnard College Foundation supporting students in the arts. Rick Najera, who doubles as Oxnard College Institute for Latino Performing Arts Creative director and host of Latino Thought Makers Series, directs the show and incorporates his cast from the original CBS Diversity Sketch Comedy Showcase performed in Hollywood with local or student performers. Originally created by CBS network, the showcase was created to provide more opportunity for diverse talent to be seen by Hollywood’s most influential agents, managers and casting directors. Named as ’50 Creatives to Watch in Hollywood’ by Variety, Najera has directed the CBS Diversity Sketch Comedy Showcase for the last 11 consecutive years. 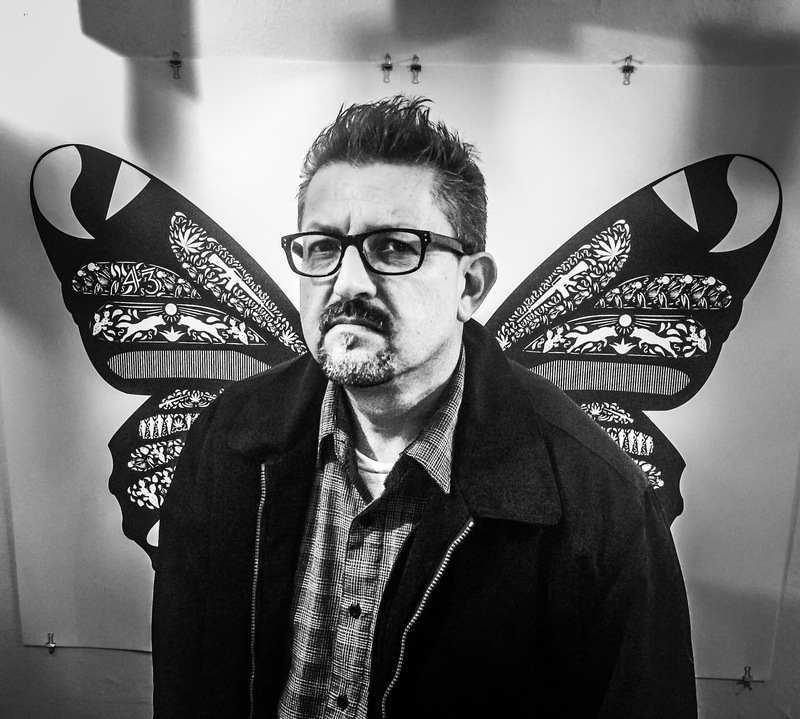 Special guest will include Lalo Alcaraz, an award-winning visual and media artist, satirist, television producer and writer based in Los Angeles. He is the creator of the syndicated daily comic strip, “La Cucaracha” as seen in the L.A. Times and other papers nationwide. Lalo is currently Consulting Producer and writer at Fox Television’s new animated program, “Bordertown,” executive produced by Family Guy creator Seth MacFarlane which debuted January 3, 2016. Alcaraz is also consulting producer on a major studio animated film to be released in 2017, author of several books and co-host of KPFK Radio’s show, “The Pocho Hour of Power”. Latino Thought Makers Series, part of Oxnard College’s Institute for Latino Performing Arts initiative, is offered free to the general public, and was created to engage, entertain and educate students of Oxnard College. View a clip of Latino Thought Makers. Oxnard College Institute for Latino Performing Arts presents the CBS Diversity Sketch Comedy Showcase plus special guest Lalo Alcaraz on Wednesday, February 3; Doors open at 6:30pm, Show at 7:00pm at Oxnard College Performing Arts Center, 4000 S. Rose Ave, Oxnard, CA 93033. Entrance and parking are free. RSVP to ocilpa@vcccd.edu for best seats.